WEBii has earned a spot as a finalist in the 15th annual Greater Austin Business Awards given out by the Austin Chamber of Commerce. The web development and marketing services company joins four other companies as a finalist in the small division section of the Time Warner Cable Business Class Customer Service & Loyalty Award category. This category recognizes businesses that display an exceptional commitment to customer satisfaction. “We are honored to be named as a finalist in the category of customer service and loyalty alongside other worthy companies. 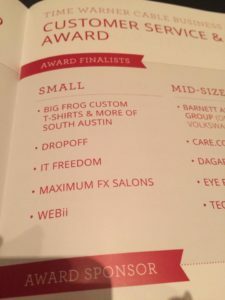 I look forward to celebrating with so many successful Austin businesses at this year’s awards event.” says Jacqueline Sinex, managing director at WEBii. The annual Greater Austin Business Awards event recognizes Austin-area companies that display excellence in business. The goal is to foster a thriving business atmosphere that benefits the city and its residents. The awards are given in nine business categories that include a “Uniquely Austin” award, a non-profit award, technology and innovation, community relations, investment and expansion, health and wellness, responsibility and sustainability, leadership, and customer service and loyalty. The awards recognize businesses of any size that demonstrate exceptional performance in the award categories. WEBii has long been one of the nominees in the customer support category, earning annual recognition between 2008 and 2013 for their outstanding performance in that area. This is the first year WEBii has been named a finalist. Awards will be announced and given out at the Chamber of Commerce’s awards dinner on August 27, 2015. Founded in 1996 as WebXess, Inc., WEBii has earned a reputation over the last 19 years for comprehensive and knowledgeable website and marketing services. These services now encompass search engine optimization, web marketing, web design, domain name registration, and web development. As a result, WEBii provides full service support to companies in the Austin area and beyond.